In a professional setting, dress is one of the most underrated parts of your job. In all actuality, dressing professionally and appropriately can help you present a better first impression, show how you conduct yourself, and allow others, including your boss and your peers, to know how much you care and respect the work you do, and whom you do it with. With that being said, as the corporate environment has evolved, so too has the customary style of dress. Through working in Finance at UPMC, I have been exposed to three different dress styles. The most formal and the most common for those in Finance at UPMC is Business Professional. 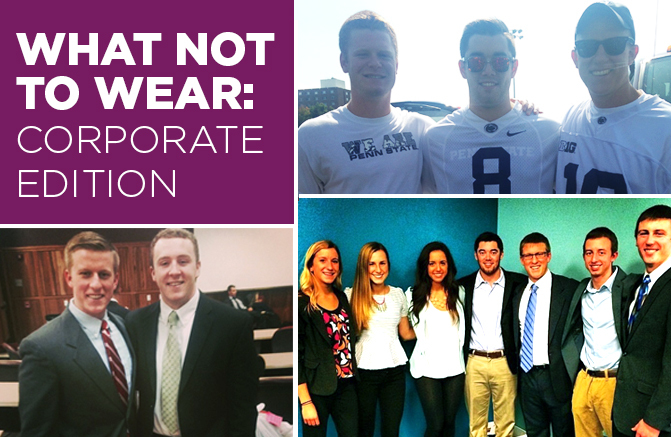 The second most formal is business casual, which many UPMC departments are adopting. Finally, for certain occasions, casual attire is appropriate, as long as it is kept within certain bounds. For men, business professional consists of a matching suit or a well-paired blazer and dress slacks, a tie, and a collared, button-down shirt. It is also pivotal to have both a belt and a pair of shoes of matching leather tone. When women dress in business professional, a matching, solid and subdued colored suit can be worn with either dress slacks or a skirt that falls below the knee. This suit should be accompanied by an appropriate blouse which is tucked in to the skirt or pants. Formal dresses that fall below the knee are also acceptable. If wearing jewelry, it should be minimal and subtle. Shoes should be close-toed and heels should not be more than 3 inches high. There are numerous variations for men’s business casual attire. Depending on the time of year and the occasion, many options are appropriate for shirts, including golf shirts, and button-down shirts, which can be accompanied by a casual blazer. Shirts should be tucked into dress slacks or khaki pants. A matching belt and shoes should also be worn. For women, business casual evolves from business professional by adding more variation. Women can wear suits with more brightly colored blouses and pants, as long as they remain workplace appropriate. Other options include dress pants and skirts which include more color, accompanied by a blazer. Additionally, cardigans and other pull over tops can be worn with a blouse and dress pants. Casual wear should be comfortable and relaxed, but should still remain appropriate for a professional setting. Jeans are acceptable as long as they do not have holes in the legs and are not washed out or faded. Shirts must remain appropriate and should preferably be collared for men. Sweatshirts, hoodies, or jerseys are never appropriate. It is important in every situation to always remember the saying “Dress for the job you want, not the job you have.” It is best to inquire what exactly is appropriate from your boss or peers. Appropriate clothing is essential in business settings, as it is often the first impression you make.